We finally know just who was with Daryl in the woods and how the heck Carol wound up in hell hospital. The Walking Dead Season 5 Episode 6 was the transition piece that tied everything together, clicked all the puzzle pieces into place, and set up what looks to be another showdown battle for the survivors heading into the fall finale. And they just got done fighting the meat-loving Terminus people. It’s tough making friends in the zombie apocalypse isn’t it? This hour pushed the clock back a bit to reveal Carol and Daryl’s journey (I still feel like there should be some 80s or 90s sitcom theme song when saying their names together) in their hunt to find Beth. While I felt that we didn’t necessarily need that entire adventure backed-up and shown (I would have been fine starting straight from where the most recent cliffhangers left off), doing so with two of the most interesting characters on the series ended up working out. There’s always been something fascinating about watching Daryl’s character grow from the redneck racist little brother of Merle to the man eager to find hope, to start over, to make some good come out of all the bad. And it helps he’s a badass with a crossbow. At the same time, Carol also has grown and progressed from her days as the timid abused wife to the take charge, make the hard decisions character. She’s found her way and made herself to be one of my favorite characters on The Walking Dead, something I probably never would have expected when watching The Walking Dead Season 1. So I was OK with listening to those two get to bond and converse about who they are, who they were, and what to do now. I love their chemistry from simple things like eating chips together to a dialogue free burning of the bodies. And there's never any fighting about which bunk to get. These two are entertaining to watch, and I love how there’s a certain support for each other both physically and emotionally. It was also interesting to see Daryl and Carol meet Noah, who wound up stealing their guns. I wonder if as viewers we would have been as sympathetic to Noah’s character if this was the first time meeting him rather than getting to know him in The Walking Dead Season 5 Episode 4. His encounters initially made me wonder where in the timeline the story was at, but it also put Daryl and Carol in their never ending predicament of just how to treat newcomers. I was certainly glad that Carol went from easily able to shoot him to willing to help him from becoming zombie chow. And I’m glad Daryl came back as well. Everybody is just trying to survive, but it’s good to see that still, even with those threats of death, some characters maintain that resilience in trying to do some good. Plus, there just seems to be such an authenticity when it comes to Noah. It never felt like he was trying to take advantage or trick them. I can't help but believe he's good, which unfortunately, could mean he might not be long for this world. Still, I hope he does wind up sticking around for some time. And I’ve got to say I was so pleased to once again be out of the woods and the wide open stretches of wilderness. To get so many scenes in the city, a new environment, one crawling with walkers was such a fun change of pace. Even the van dive off the bridge was rather intense, though the outcome seemed to be a really really lucky miracle for them. It was like they were barely injured, and that van landed hard. That was definitely a stretch for me. If anything, Carol needs to stay away from vehicles all together after getting plowed into by the hospital cops. Did she not see it? All these close calls, all the heavy focus on Carol as a changed person is making me nervous she’s not going to survive much longer. And I’m really hoping that’s not the case going into the fall finale. So did we really need to back things up to fill in the blanks? Probably not, and it could have been explained easily by a character in a few sentences. At the same time, for it being Carol and Daryl, I was into watching them together, taking some time to talk, and finally closing up the big questions we’d been previously left with. What did you think? Did you like going back to see what Carol and Daryl had been up to? 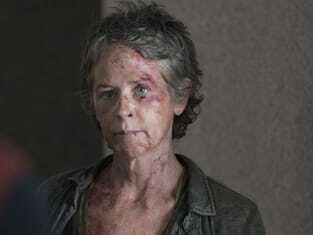 Will Carol survive past the fall finale? Sound off below, and make sure to watch The Walking Dead online for all the zombie goodness. Here, meanwhile, is your first look at The Walking Dead Season 5 Episode 7, "Crossed."